The real Budo is love toward protecting (giving protection) of all beings in a spirit of reconciliation. “Reconciliation" (to reach a consensus, rapprochement) is to allow everyone to realize his mission. 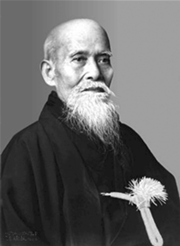 I would like the wise and delicate in its essence people to hearken unto the voice of Aikido. Not to correct others but to rectify themselves - their own mind and way of thinking. This is Aikido. Aikido - this is not resistance. Since it is not resisted, it has always won. Since the word "ai" (harmony) is like the word "ai" (love) I decided to call my original "Budo" Aikido, although the word "aiki" is an ancient. The word that was used by warriors in the past is completely different from the one I use. "Aiki" is not a technique which to use to fight the enemy and to win. This is the Path (approach) to make peace with the world and to build with other human beings one family. The secret of Aikido lies on harmonizing oneself with the movement of the world and to bring ourselves to agree with the world itself. The one who has gained the secret of Aikido has the world in himself and can say, "I am the world." Those who tend to create turmoil and conflicts would be defeated in the very beginning. I've never been defeated, as has been quick the attack enemy. But this has been not because my attack has been proved faster than that of enemy. This is not question of the velocity (speed) in this case. The battle has done over before it begins. When an enemy tries to fight with me, with my world, he should break (destroy) the harmony of the world. Therefore, the moment in which he decides to fight me, he is already defeated. There is no measure for the time - fast or slow. Those who do not agree by the fact would not be in harmony with the world. Their Budo is Budo of the destruction. This is not creative Budo.